The day Summer Sales started was the same day I went out of home (yes, I had not seen sunlight for a long time, just like a captive) after my final deliveries and exams. Believe it or not, I was amazed to walk on the streets again, with nothing to worry about, no more stress and with that feeling of having achieve my goal this year. So, that day we went window shopping. Yes. Window shopping, because everybody knows that season sales are best when they're about to end. Anyway. I ended shopping more things than I was supposed to. Specially shoes. More specifically flat shoes and ballerinas. But I can explain it and maybe you'll understand me for doing this... Super insane haul. First of all: although you can find me wearing heels around here almost everyday, I use so, so much flats on my off-Internet-dayly basis. I spend my winter literally running from here to there on the Architecture School because I'm out of time on this delivery, because I'm late (irresponsible me...) or I just spend so much time around there than at home that my feet end super destroyed and tired at the end of the day. So, I need shoes that are comfortable and super easy to wear. Plus, ballerinas are really easy to mix with almost any outfit. I find them pretty difficult to find (at least when it comes to size, shape and basic colors I'm addicted to) and sometimes they're a bit pricey. So, when I started finding them along my window shopping morning on my size, the colors I needed for this winter and also at a great price, I couldn't help but start piling up. 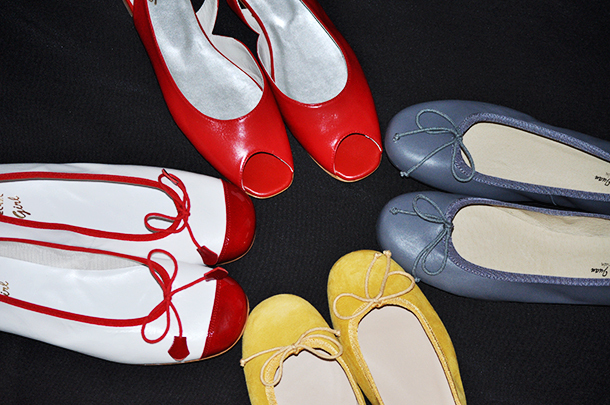 My flat shoe haul ended more or less as you see on the picture above: dark grey, mustard, combined white and red ballerinas and these peep toe flats for summer. Are flat shoes and ballerinas on your daily basis closet? Or you are more the heels everywhere type?